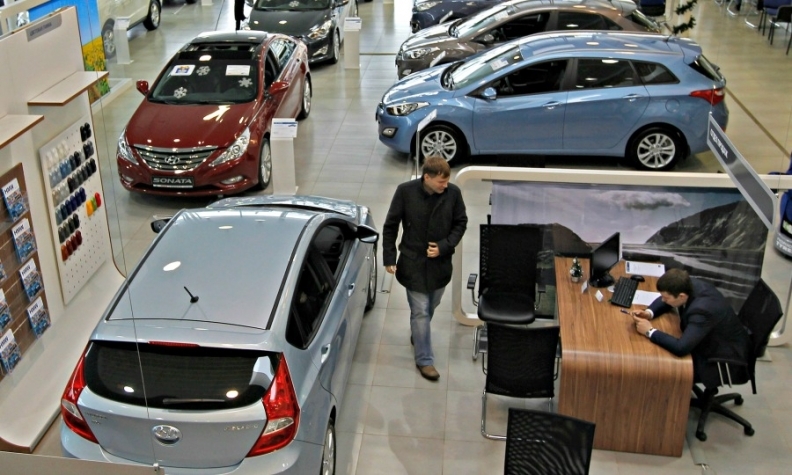 MOSCOW -- New-car sales in Russia rose 18 percent in April, as consumers hastened purchases anticipating that ruble weakness will push up prices, the Association of European Businesses (AEB) lobby group said. "The noticeable weakening of the ruble exchange rate in recent weeks has been an extraordinary factor motivating customers to accelerate the purchase of a new car in anticipation of potential price increases," said Joerg Schreiber, Chairman of the AEB Automobile Manufacturers Committee. The ruble has shed nearly 9 percent of its value versus the dollar since the U.S. imposed new sanctions on prominent Russian businessmen and their companies in early April. It traded at 63.33 per dollar on Tuesday. Russian consumers usually interpret ruble depreciation as a sign that prices for cars, which are mostly built from imported parts and materials even when assembled locally, will rise, as happened after the ruble's steep decline in 2014-2016. "New vehicle orders have spiked as a result, and will continue to materialise as extra good news in the sales statistics in the short term," Schreiber said in a statement. The Russian market is recovering from four consecutive years of decline as the economy returns to growth. But annual vehicle sales are still well below a peak of nearly 3 million reached in 2012. Last month, the AEB forecast that the market will grow 10 percent this year to about 1.75 million units as it recovers faster than expected. Through April, sales rose 21 percent to 545,345. Russia's car market has been recovering after sales fell sharply during an economic downturn that was exacerbated by 2014's plunge in prices for oil, the country's main export, and by Western sanctions. All the top-selling brands recorded major rises last month, with Mitsubishi seeing the biggest gain as sales jumped 139 percent. Mazda was the next big winner in April, with a leap of 78 percent. Sales at Toyota jumped 24 percent, VW brand gained 23 percent and Kia registrations increased 22 percent. Ford registrations rose 21 percent, while Skoda was up 18 percent and market leader Lada gained 17 percent. Download PDF, above right, for April and 4-month sales by brand, automaker and group. Hyundai sales rose 16 percent, Nissan 14 percent and Renault 3 percent.